Red Funnel, the leading Isle of Wight ferry provider, has launched a red hot February offer which allows up to 25% off any cross-Solent vehicle ferry journey booked and completed by 28 February 2019. The discount is applied automatically when booking online only at www.redfunnel.co.uk/RedHotSale. Enjoy savings on bookings and travel until the end of February. The offer is available for up to seven people in one vehicle and comes at a perfect time for booking a Valentine’s or February half term break. Escape to England’s largest Island as a couple, as a group of friends, family or a simple solo break for a few days of relaxation off the beaten track. What’s more, whilst enjoying Red Funnel’s February offer, passengers can enjoy a complimentary glass of fizz throughout February when upgrading to the Signature Lounge. Offering a fabulous, relaxing space ideal for passengers who want a more relaxed experience, the Signature Lounge is available on all vehicle ferries. For just a £10 upgrade per person, passengers can enjoy a wide range of benefits including unlimited hot drinks and a range of sweet and savoury snacks amongst much more. Whether choosing to travel via a car, motorcycle, minibus, motorhome or private towed vehicle, the Isle of Wight is only a Red Funnel crossing away. To book or find out more please visit www.redfunnel.co.uk/RedHotSale or call 023 8001 9192. 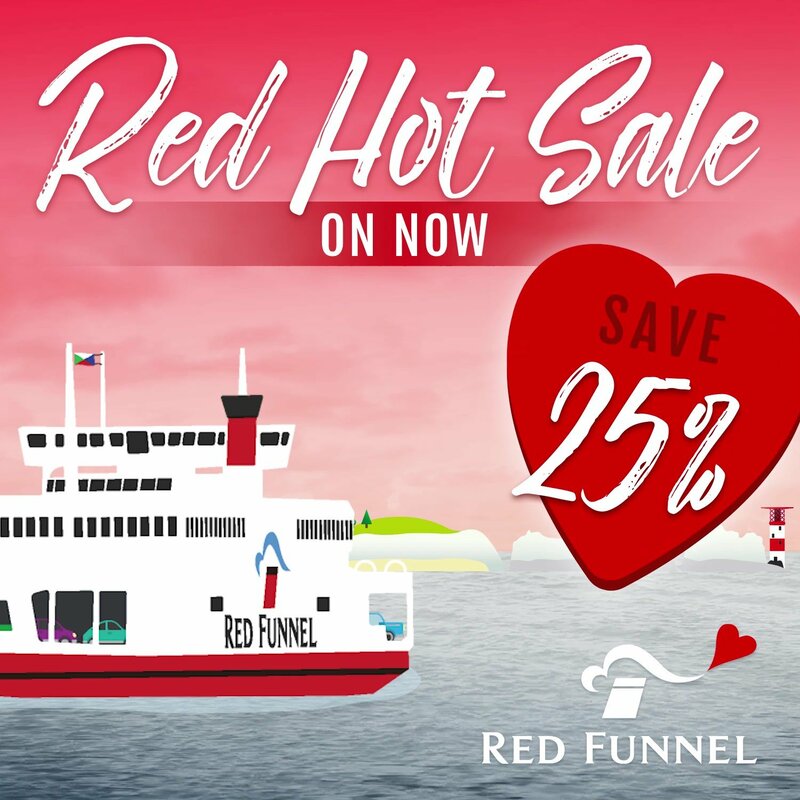 Red Funnel’s Red-Hot February Sale is valid for 25% off return vehicle ferry travel (any duration) when travel is booked and completed by 28 February 2019. Offer is valid for up to 7 people (additional passenger rates available) in a car, minibus, motorhome, motorcycle, or private towed vehicle. Offer must be booked online at www.redfunnel.co.uk/RedHotSale and is valid for bookings between Southampton and East Cowes (both directions). New bookings only and offer is subject to availability. Cannot be used in conjunction with any other offer or discount, including standard Travel Card holder discounts. Red Funnel reserves the right to withdraw this offer without prior notice. Standard terms and conditions of carriage apply. Offer valid for paid Signature Lounge guests only. Limit one (1) free 125ml glass of sparkling wine per person per paid crossing. Offer valid until 28th Feb 2019 while supplies last. Red Funnel reserves the right to amend or cancel this promotion at any time or offer a substitution. Must be 18 years of age or older to claim free glass of sparkling wine. Please drink responsibly. For more information visit drinkaware.co.uk. Please note that children under 12 and pets (with the exception of assistance dogs) are not permitted in the Signature Lounge. The Signature Lounge is available on selected sailings only. Terms and Conditions of entry apply, see redfunnel.co.uk/signaturelounge for details.